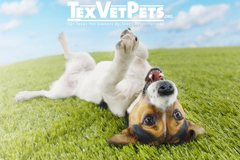 Every dollar that you donate to the Texas Veterinary Medical Foundation makes a difference in the lives of Texas animals. Through the TVMF PALS program, Rusk Veterinary Assistance Grants, Veterinary Student Support, and Disaster Relief, TVMF is working with veterinarians to improve the lives of animals, and the people that care for them, across Texas. Your donations provide veterinary care to animals in need, ensure that elderly, homebound, or disabled Meals on Wheels clients will be able to provide for their devoted companions, and support veterinarians and veterinary students in times of crisis. Your donation today will transform the lives of Texas pets! For more information on ways to give visit tvmf.org.